Not what the scale reads when you step on. What a dumbbell or barbell is. Weight that you lift. Weight that causes your muscles to work. To counter the depreciating effects of many of our sedentary lifestyles in front of a computer, at a desk or even traveling with plane time, heavy meals, alcoholic beverages and all of that whittling away any time to ‘exercise’. While I have not lifted every month of my life and there may even be a few years when I did not pick up a weight, weight lifting has been a ‘comfortable’ (relatively) part of my experiences. I have been kinesthetic my entire life with exercise as a central part of my personal goals. Nothing has given me the results that weight lifting has. I can feel the results immediately and they continue as I advance a program. Likely as I just had a birthday and am on the forever journey of being more mindful, I began to wonder about this – women and weight lifting. I was exposed to weight lifting in high school on the girls track team. Belonging to a gym was also an emerging trend when I was in college and as a new undergraduate working professional I belonged to a gym (thanks to my disregard for credit card debt.) A free assessment and ‘program’ was part of your membership. It was assumed you would be lifting at the gym. Maybe we need to re-evaluate high school programs. Even one sport or one part of a year through PE would introduce weight lifting to girls so they could gain awareness and confidence. So they could experience the results early in life. 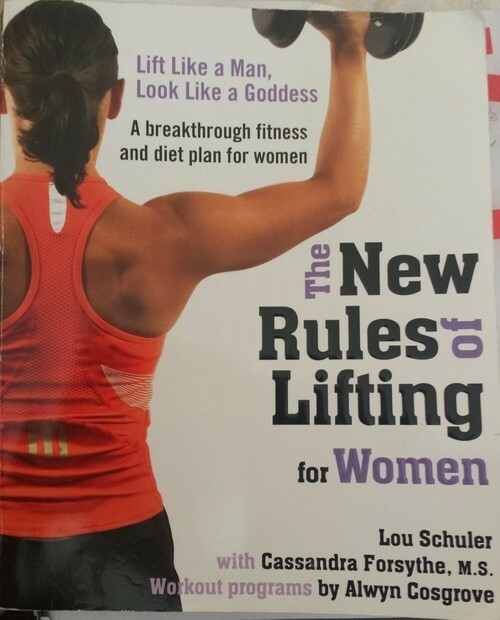 My current program is one I have completed before: The New Rules of Lifting for Women. This is a great program with key insights about the mis-conceptions, diet and results-based focus that each woman can individualize. It helps that my husband is also doing The New Rules of Lifting (men’s version) and having a workout partner (even if all you do is go to the gym together) is significant to long-term commitment. Talk to the young girls you know. Ask if they have ever lifted weights before. Invite them to join you at the gym sometime. Try Lou and Alan’s approach and put a great pair of headphones in and ignore the testosterone wandering about. Your workout will help theirs and vice versa.